Summarize: I consider that composite odd numbers formed by the multiplication of a prime number by itself n times, by example 9, 27, 81, etc (for the prime number 3), are imaginary prime numbers that reflect the real prime number 3; but the imaginary plane that reflects the real is interdimensional, by example a spiral one. On this perspective I think it appears so evident the logical distribution of the complex prime numbers and the rational rules that obey. I think that considering imaginary prime numbers the Riemann hypothesis would be refuted. The prime numbers problem is mainly a conceptual problem. (Notes about the picture above: I entitled it “antinumbers” because at the beginning I identified the imaginary prime numbers with antinumbers with exact opposite mirror symmetry with respect to prime numbers. On the top list of numbers I have marked with a circle the odd composite numbers formed by the product of two different prime numbers; In the picture above I marked with a circle the numbers 3, 9 and 27 only for making them more visible). Some physicists and mathematicians have tried to look for a physical structure whose periodical variations, for example the emission frequencies of a hypothetic atomic nucleus, a possible “Riemannium”, could correspond with the frequencies of the Riemann function. This was for example the attempt of the Hilbert-Pólya conjecture. I tried to do something similar in a somewhat confusing way on the previous post. In the present post I am going to try to explain directly what prime numbers and anti-numbers are using the non conventional atomic model that I defend on this blog. I think that the problem with the Prime numbers’ periodicity is only conceptual. 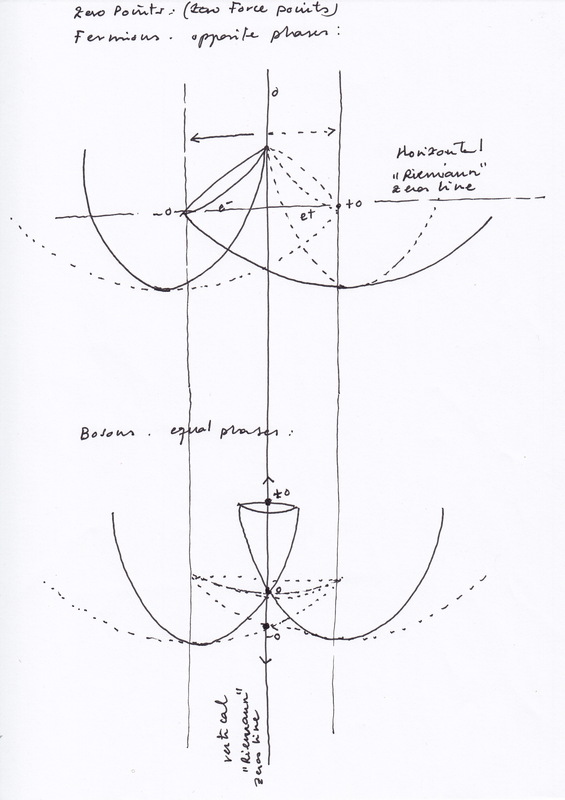 If we consider an electron as a field that moves toward the left side from a central point of symmetry and a positron like the same field that moves later toward the right side, the electron field will be the antiparticle of the positron field, because they have mirror symmetry (they are exactly the same field, but with opposite features because of their opposite location). Dirac antimatter supposes two different fields that exist in equal (or different) times, at opposite (antisymmetric) places, they are in fact to fields, non one field that moves spatially. Majorana antimatter supposes a particle that itself is its own antiparticle. It is a virtual antiparticle because it exists at different times. The picture below is the model of atomic nucleus that I defend: It is created by the entanglement (physical intersection) of two fields (that I consider gravitational) that vary periodically with the same or opposite phases. They create in their intersection four new fields that I consider the subatomic particles that form a shared atomic nucleus. 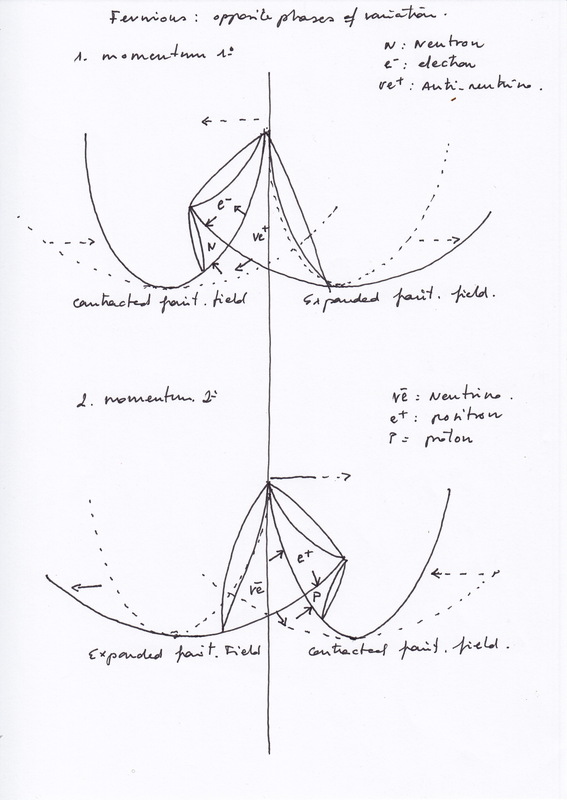 In the picture above, the gravitational fields vary with opposite phases, when one field contracts the other expands, and the subatomic particles are “fermions” ruled by the Pauli exclusion Principle. In the picture below, the gravitational fields vary with the same phase, they expand or contract at the same time. Here, the created subatomic particles are “bosons”. there is a central symmetry at the horizontal axis but an asymmetry at the vertical axis. Thinking about the meaning of the prime numbers and their anti-numbers I have considered a new movement that I had been obviated previously on the atomic mechanism. I think that the atomic nucleus turns on itself too. In the case of the electron field (when it comes to fermions), the axis of the electron field will experienced a gradual displacement through the whole horizontal plane, describing a circle which center will be the intermediate point of symmetry between the electron and now virtual positron fields. When the electron field reaches the maximum left distance, the pushing force that it created with the external face of their left side and with the internal face of their right side, disappears. It is a zero force point. And now, while the field is still stopped until it stars moving again toward the right side becoming a positron, there is a lapse of non time that crates a delay. This non time period produces that the electron, when it becomes virtual and starts moving toward the right side becoming an actual positron, does not follow the exact antisymmetric path that followed previously the electron when moved toward the left side. The axis of the electron field has experienced a spatial advanced. Seen so, electron and positron can not be considered Majorana antiparticles. But because of this prelation advancement the electron field will move progressively from the West to the South and to the East Cardinal points of its horizontal plane with a precession movement. When it finally arrives to the right side, the cardinal East, it will became an exactly antisymmetric electron, it will become a true positron. This will occur periodically too. On this view electron and positron are Majorana antiparticles. The oscillation of the electron will be similar to a Foucault’s Pendulum. Made these clarifications, I will focus the explanation on the prime numbers. I consider that a Prime number is an electron that moves toward the left side. It is odd. When it moves toward the right side it does not follow the same antisymmetric path because of the mentioned prelation displacement. The even number path, the positron field pendular movement toward the right side, experiences an advance on the horizontal plane toward the North point. 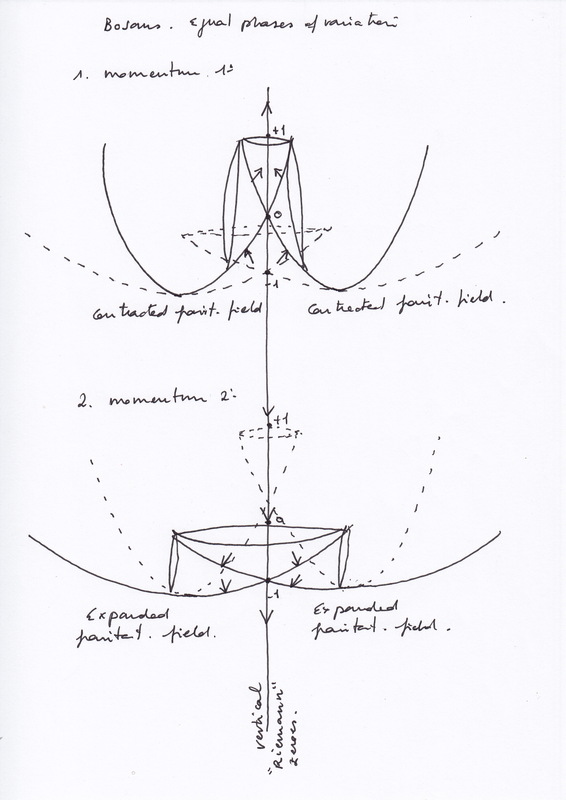 If look at the picture on top of the post, you could follow the pendular movement of the electron field that progressively creates odd numbers on its non zero force points. Its first oscillation will create the number 1 at the left side, and the number 2 at the right side. Then, the left movement will create a number 3 displaced spatially from the previous 1. This number 3 does not have any other antisymmetric number, there is not any mirror number still, and it is not the mirror reflection number of another previous number. When the electron field that creates the number 3 comes to its maximum left distance and stop moving it can be considered like its force were divided by itself. It only can be divided by itself. Continuing with the pendular oscillation, we will arrive to the number 9. The number 9 is the radius of a circumference that has a different perimeter than the circle whose radius is the number 3. The number 9 has mirror reflected symmetry with the number 3, although it is displaced toward the right side. It is like the same number 3 had experienced a spatial displacement outside its real axis toward the south east cardinal point; this new axis of the number 9 is an imaginary axis. I consider imaginary axes like mirror reflected axes. The number 27 is the radius of a bigger circumference too. Its has a direct mirror reflection symmetry with respect the number 3 raised to the power of 2 (the number 9) and a derivative mirror reflection symmetry with respect to the number 3. 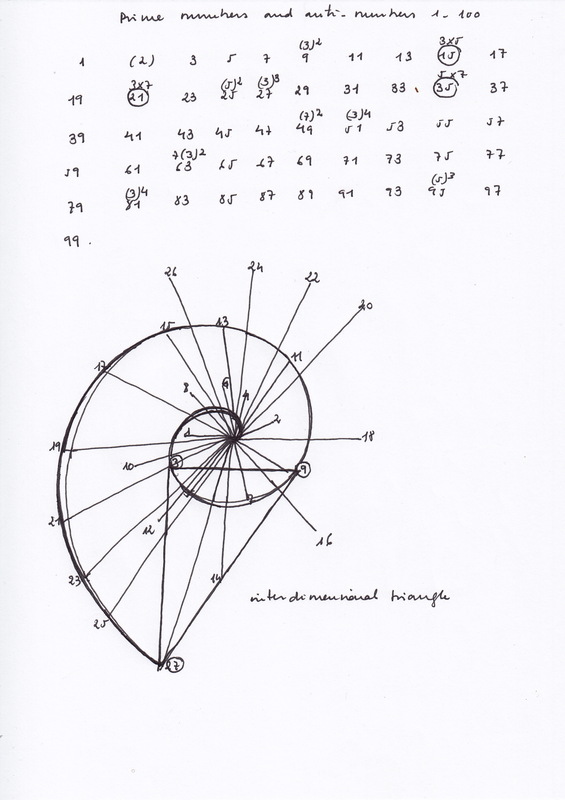 But the imaginary plane that reflects the number 3 in the case of the number 27 is not a straight line, it is a spiral. In this sense the number 3 can be considered as a real prime number, and the number 27 its imaginary prime number. We can draw a triangle formed by the numbers 3, 9 and 27. It is a virtual or imaginary triangle formed by different dimensions, three circumferences with different perimeters forming a spiral path. It is an interdimensional figure. The sides of the triangle can be considered as interdimensional gates that let avoid the spiral way and to pass from the 27 point to 3 point in a straight way passing through the spiral. You will remember that the 3, 9 and 27 numbers are zero force points on the exposed atomic model. Interdimensionality maybe explains why some numbers are irrational. On the other hand, if we use Pi for calculating the value of the number 27 basing on its original prime 3, it could be 3 multiplied by Pi raised to the power of 2, we do not get 27, we get 29. Is it a bad operation or is the Pi number reflecting the prelation displacement that I mentioned above? Basing on these considerations I think the distinction between prime and non prime numbers is artificial. There are numbers that reflect others and numbers that are reflected by others. The number 3 of the real axis could be the imaginary 3 of another real axis if we changed our perspective. What is real and what is imaginary (mirror reflected) depends on the perspective that we start watching. I think odd composite numbers formed by the product of two different prime numbers are expression of a sort of different symmetry. With respect even numbers they can be considered anti-prime numbers (do not mistake with prime anti-numbers). Their properties depend on the starting point too, if we start counting by 2 instead by 1, they will behave like odd numbers. If we follow the even path in the top picture it is possible to draw an inverted spiral too. Watching the whole picture you will see how some odd numbers are placed at the right side and some even numbers are at the left side too, periodically. On the other hand I have not mentioned the mechanism of bosons when the pendular movement occurs on the vertical axis. And that I think that because of the periodical synchronization and desynchronization of the phases of variation of the entangled gravitational fields, the fermions became bosons and bosons became fermions periodically. I think that it is necessary a comprehension at a conceptual level about what prime numbers are. Considering that prime numbers raised to the power of n are imaginary prime numbers of a real prime number I think the Riemann Hypothesis would be invalidated conceptually. But what does it mean that a number is only divisible by itself? and what does it mean to divide? I think there are two kind of divisions, to separate what is unified or two fold what is unfolded. In the case that we count 1, 2, 3, the number 3 appears folded, we can fold it because it does not have parts in the real axis that we took as reference. But if we unfold the number 3 into 9 or into 27 or into 81, if we multiply the number 3 by itself n times, we do not have now a unique number 3, we have a number 3 unfolded in other numbers 3 that we can fold now. I think numbers are symbols that express symmetries and asymmetries, they do not have any entity by themselves outside the abstract level. They refer to concrete spaces. I think prime numbers must be thought in a concrete scenario, as the atomic model that I purpose. What about a scenario where the imaginary axis has a non smooth topology, or it varies periodically expanding and contracting? How about a scenario where the real axis has a non flat topology that vary periodically too with the same or opposite phase than the imaginary axes? How about, finally, if it were not exist a vertical plane, only a horizontal plane with a spiral laying on it? the real and the imaginary axes would exist at the same horizontal plane separated by different dimensions. One arm of the spiral would have the real axis and the other arms would be the imaginary axes on a unique but interdimensional plane. Each dimension, each arms, will be circumscribed by a circumference of different perimeter ruled by a different power the the Pi number. The places where we will found the numbers will depend on the shape of the real and imaginary planes and their topologies, variations and periodicities. And it will depend on our own perspective and references. A prime (folded) number 3 on the real axes, can be at the same time a part of an unfolded number 3 which exists on other axis that we could not consider but is the real axis for another observer. A real axis will have always at least two imaginary axes that reflect. But what is real for us because of our reference point, can be at the same time imaginary for another observers with different points of reference. Are we limiting our comprehension of an infinite and inexhaustible reality because of our rigid, limited and academic definitions about how is the reality and how must it be? But do you only want to know what numbers on the common real axis are only divisible by themselves and their periodicity? then look for the numbers that appeared previously. You can choose between look for on a straight large line or on the short lines of the interdimensional gates of a spiral using the help of the Pi number. I told before that the electron field was divided by itself for achieve the zero force point, but really I think that it stopped because the entangled gravitational field that created it stopped contracting to start expanding. Each one of those two entangled fields depends in turn on and exists by the entanglement (I remark here the meaning of physical “intersection” because I know the different sense that mainstream physicists use the term “entanglement”) of at least two bigger entangled fields and so on in an infinite way. Maybe these reflexions are inconsistent and inaccurate for many mathematicians. But I have the strong hope that some of these ideas could inspire someone, maybe you, why not, looking for a better comprehension of the Nature’s mechanisms. I think we need to change the currently accepted atomic model and to rationalize currently accepted physics, (maybe mathematics too), questioning and rejecting all their arbitrarieties, for comprehending better and be able to cure all cell division diseases, what is the goal of this blog. All our cells are electromagnetic and our current science, in my opinion, yet do not know what electrons are and what the essential role that gravity has at the atomic level is. If you want more information about the mentioned atomic model you can read other posts on the blog. They are fragmentary and disordered because I have developed an improved the model in a progressive way through the last years and the blog reflects the creative process. Hola, ¿podrías explicar mejor cómo se forma la espiral interdimensional de la primera imagen? No me queda claro como es que cada número queda en esa posición. si vemos la figura como como si fuera un campo que estamos observando desde arriba, podemos pensar en un campo circular que está contraído y se expande. Si hay un objeto que orbita el campo empezando por el 1, cuando llegue al punto 2 la distancia con respecto al centro será mayor que la distancia del 1 con respecto al centro porque el campo se habrá expandido. Además al llegar al punto 2 el objeto ha recorrido más de la mitad de la circunferencia por lo que habría un movimiento de precesión en cada media rotación (por eso el radio que lleva del centro al punto 2 está desplazado con respecto el radio que va del centro al punto 1, y así pasa con todos). Este artículo lo escribí hace 4 años, tendría que estudiarlo ahora para saber si lo que dije me parece correcto porque desde entonces he pensado muchas otras cosas. Ten en cuenta que el blog es muy especulativo y nada ortodoxo.